With Samsung lowering its quotes substantially, the NAND flash market prices have fallen even more in the first quarter of 2019, the sources said. Nevertheless, the price drops are expected to narrow to less than 10% in the second quarter, and may begin to rally in the third quarter when demand particularly that for servers picks up, the sources noted. Revenues of the global NAND flash industry declined 16.8% sequentially to US$14.16 billion in the fourth quarter of 2018, but still hit a record high of US$63.2 billion in the whole year. NAND flash prices are unlikely to fall further given major chipmakers' control over capacity, said the sources, adding that the firms are also slowing down their transition to 96-layer 3D NAND chip technology. NAND flash prices should reach their lowest levels for 2019 in the first quarter. So, we have our cartel tightly controlling stuff. My talks show that it is still huge profits in NAND market. And prices could fall around 2-3 times without any damage to manufacturers (outside top management bonuses and investor profits). "We expect NAND prices to continue falling through 2019, which will drive meaningful increase in client SSD adoption in PCs starting in the middle of this year," Kou noted. Such positive development resulting from the chip price fall "does not happen immediately," . Citi expects NAND pricing to fall 45% in 2019 while DRAM falls 30% and doesn't see a bottom in pricing until Q2 at the earliest. YMTC is expected to build a close relationship with Longsys after growing its production yield rates to mature and stable levels, the sources continued. 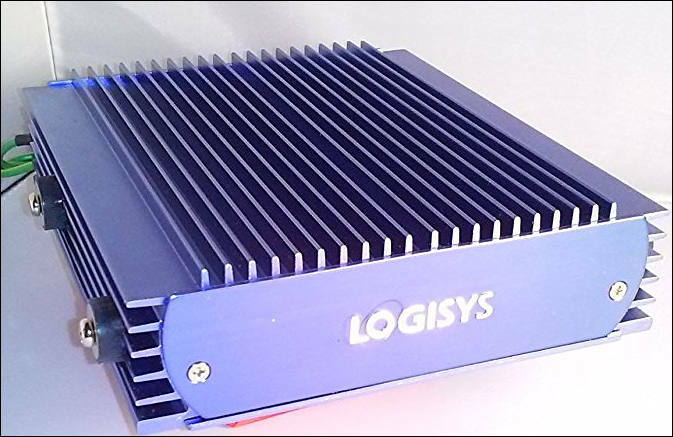 YMTC's in-house developed 64-layer 3D NAND flash will be adopted in Longsys' SSD and UFS products. China's Yangtze Memory Technology (YMTC) started delivering samples of its 64-layer 3D NAND chip with volume production in the third quarter of 2019. The company also plans to move directly to the 128-layer generation with volume production scheduled for 2020. YMTC has no plans to provide 96-layer 3D NAND chips as the company intends to skip the generation and jump directly to 128 layers. Chairman of Adata Technology, a Taiwan maker of DRAM modules and NAND flash chips, said that globally leading NAND flash makers have yet to slow down capacity expansions, and prices may see a larger drop in 2019 than in 2018. Industry sources said that there are now 6-7 leading makers of NAND flash products around the world, all devoted to developing new-generation production processes. Among them, Samsung, Toshiba Memory/Western Digital, Mircon/Intel and SK Hynix have released their respective 96-layer 3D NAND technologies for volume production in the first half of 2019. NAND flash contract prices are likely to fall by a larger-than-expected 10-15% sequentially in the third quarter and another 15% in the fourth. NAND flash contract prices fell between 15% and 20% sequentially in the second quarter, but bit shipments bounced back thanks to a pick-up in demand for high-density products from China-based smartphone vendors. NAND flash prices will continue to drop in the third quarter of 2018 as suppliers scale up their 3D NAND chip output. 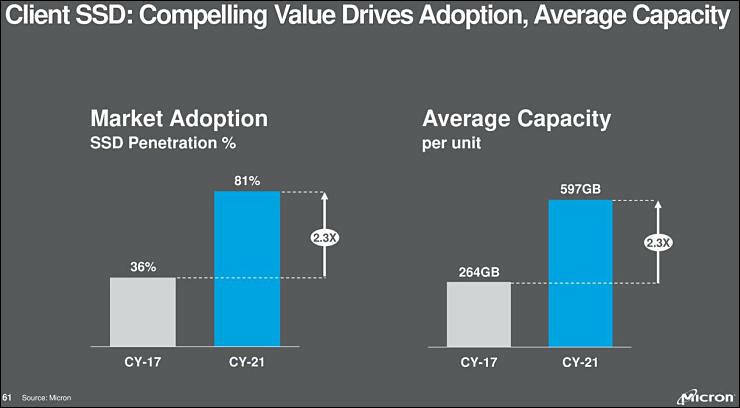 NAND flash demand has not been strong enough to digest the industry's capacity, which will likely persist through the third quarter. Judging from the continued oversupply, the sources expressed concerns NAND flash prices will still be on their downward trend in the second half of 2018. The market oversupply will become severe between the fourth quarter and the first quarter of 2019, when seasonal factors are taken into account. 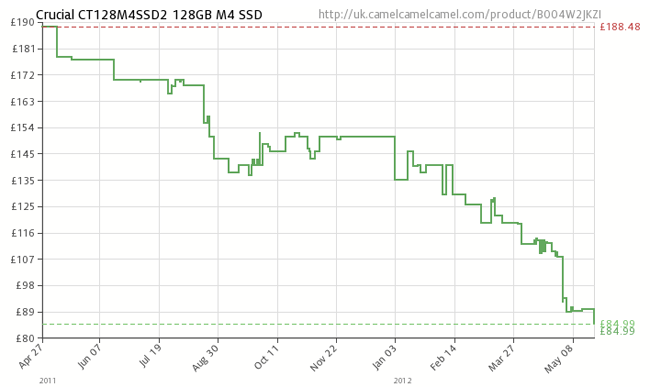 As chip firms improve gradually their 3D NAND production yield rates NAND flash prices will trend downward in the long term. NAND flash prices will fall to as low as US$0.20 per Gb when 3D NAND production becomes mature. NAND flash prices started falling at the end of 2017, but the price drops have slowed to about 10% in the second quarter, said the sources. With end-market demand picking up on seasonality, the market oversupply will be less significant. NAND flash prices may continue to trend downward but at a much slower pace in the third quarter, with a possibility that prices may stop falling. SSD prices had fallen about 50% from November 2017 to the end of the first quarter, Phison Electronics chairman Khein Seng Pua remarked recently. Prices are likely to rebound before or after the Computex 2018 trade show, and the supply of NAND flash will become tight again. Client SSDs are expected to transition from SATA to PCIe NVMe in 2018. $268 it is, 223 EUR. Very close to target. My solution is a FreeBSD NAS - 8 8T drives in raid6 (raidz2) with 2 1T drives for cache (l2arc) connected by 10gE. It's more than fast enough for just about anything that I do (including 4k prores). The NAS sits in another room where the sound of a pile of hard drives won't bother me. If you don't want to deal with FreeBSD directly, you can use FreeNAS which has it under the hood, but gives you a nice GUI front-end for it. It's not an extremely cheap solution, but it is very effective. On the other hand, there was a deal posted here for Micron 2T SSD's for pretty cheap - I don't remember if it was 4T worth for less than 400 euros, but if not, it was still pretty close.